KingsWord Ministries International was conceived in August 1990 when God spoke to Kayode Ijisesan fondly known as Pastor Kay the words “...raise me a supernatural army” in an unusual divine encounter. He was a college student in a Pharmacy School at this time. The first seed of this great vision was planted in Aprill 1993 with the inception of a college ministry originally known as Victory Christian Fellowship now KingsWord Campus Church, Obafemi Awolowo University, Ile-Ife, Nigeria. On November 21, 1997, KingsWord Ministries International (KMI) was officially commisioned. The Church arm of the ministry known as KingsWord International Church (KIC) was later inaugurated on the 31st of December, 1997 in the city of Lagos, Nigeria. Presently, there are twelve vibrant Churches in Lagos metropolis alone. God instructed the set man, Pastor Kay to relocate his family to the United States in November 1999. KingsWord International Church, Chicago which is presently the Apostolic headquarter of the ministry was established on the 1st of September, 2002. In obedience to God, the ministry has planted Churches that are committed to discipling this generation in the supernatural power and principles of God in four continents thereby fulfilling KingsWord Everywhere mandate. The weekly broadcast of the ministry, 'The King's Word' is seen in over 200 nations on several television networks. Pastor Kay is happily married to Mayowa, fondly called Pastor May. They reside in the Chicago area of the United States from where they provide an apostolic covering for the missions and churches of the ministry in North America, Africa, Asia and Europe. 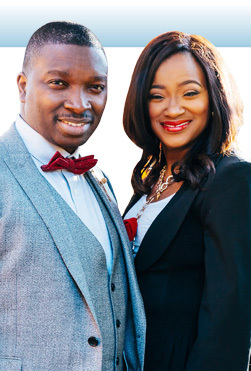 They are blessed with two children: Tolu and Temi. To raise multiracial and multigenerational congregations all over the world which allows individuals of all ethnicity and ages to have healthy covenant-based relationships. S - Spirit Filled Lifestyle that commands dominion. U – Uncompromising Word of God as the Final Authority. P - Purpose Driven Supernatural Army. E - Excellence in worship to God & service to humanity. R - Relevant & connected to the society. N- New Creation Realities consciousness established with Grace Culture. A – Atmosphere for Miracles in our gatherings that makes receiving from God natural. T – Team and Family Spirit that emphasizes effective collaboration. U- Unconditional Love of God as our unshakable foundation. R – Relationships that are covenant centered & purpose motivated. A – Accountability to God and Leadership. L – Leadership that is exemplary everywhere.